Saturday December 8th my daughter said “I Do” to her college sweetheart. It was a night to remember. A night filled with beauty and love! A warm potato salad with chickpeas, broccoli, feta and Middle Eastern flavour and a return to the blogwaves of La Spud - what's not to like? Come and join me at Lili in the Kitchen for a delicious Chilli recipe taken from Nigella Express!! This was my very first Blog post in 2008. I have moved it to the top as it is being published on this The Hankering Palate. Sarah is an aspiring Food Writer and has obtained her Culinary Diploma from The French Culinary Institute in New York City. She is publishing posts from other foodie Blogs in a series. It is certainly a privilege for my little post to be used. Pop along, have a read and leave a comment. It will be an interesting week. Wheaten Bread (or Brown Soda Bread as it is called by non Irish folks) is a part of the everyday diet in this part of the world. Very quick and easy to make it is a wonderful accompaniment to most dishes and delicious with just butter and jam or cheese. I learned to make this at my Mother’s knee. Very few meal times at home did not have this bread on the table. The very smell of it baking takes me back to my childhood. It is a haunting feeling to think that a Grandmother of mine, perhaps two hundred years ago, was making this bread too. Two major factors have long affected the course of Irish baking. The first is our climate. In this land where the influence of the Gulf Stream prevents either great extremes of heat in the summer or cold in the winter, the hard wheats, which need such extremes to grow, don't prosper... And it's such wheats that make flour with a high gluten content, producing bread which rises high and responds well to being leavened with yeast. Soft wheats, though, have always grown well here. The other factor, in the last millenium at least, has been the relative abundance of fuel. The various medieval overlords of Ireland were never able to exercise the tight control over forest land which landowners could manage in more populous, less wild areas, like England and mainland Europe: so firewood could be pretty freely poached, and where there was no wood, there was almost always heather, and usually turf too. As a result, anyone with a hearthstone could afford to bake on a small scale, and on demand. The incentive to band together to conserve fuel (and invent the communal bake-oven, a conservation tool common in more fuel-poor areas of Europe) was missing in the Irish countryside. Short elapsed baking times, and baking "at will", were easy. From these two methods are descended the two main kinds of soda bread eaten in Ireland, both north and south, to the present day. 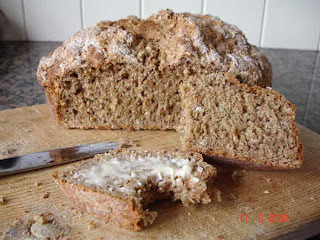 In Ireland, "plain" soda bread is as likely to be eaten as an accompaniment to a main meal (to soak up the gravy) as it's likely to appear at breakfast. It comes in brown or white, and two main types: cake and farl. The latter are primarily regional differences. People in the south of Ireland tend to make cake: people in Northern Ireland like the farl better (though both kinds appear in both North and South, sometimes under wildly differing names). Cake is soda bread kneaded and shaped into a flattish round, then cut with a cross on the top (this is supposed to let the bread stretch and expand as it rises in the oven but it’s really to let the fairies out) and baked on a baking sheet. A farl is rolled out into a rough circle and cut through, crosswise, into four pieces and usually baked in a heavy frying pan or on a griddle, on top of the range rather than in the oven. With all this said, the basic business of baking soda bread is extremely simple. The urge to be resisted is to do more stuff to it than necessary...this is usually what keeps it from coming out right the first few times. Once you've mastered the basic mixture, though, you can start adding things, coming up with wonderful variations like treacle bread and so on. Now you have had the history.............go make some! Cut the butter into small pieces and rub through. Add enough buttermilk to form a soft but easily handled dough. It should not be runny. Knead lightly and quickly into a round and place in prepared tin. When it comes out of the oven cut yourself a big slice, slather it in butter not minding that it dribbles down your chin in the enjoyment of it all. A very interesting post! I really enjoyed reading it and learnt many fact about Ireland/Soda Bread. Nothing like wheaten bread (we called it brown bread at home)warm from the oven! I like that your recipe has wheat flour in it. I am definitely going to try your family's recipe. 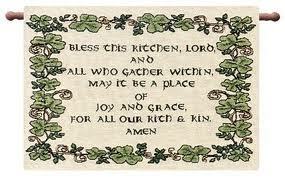 Thank you for sharing a recipe that is very dear to you. Tried the wheaten recipe - perfect! Thanks for posting it and so many others pludorous recipes.